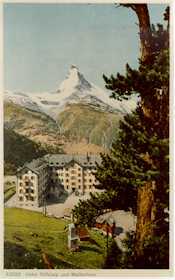 An antique color postcard shows the old Riffelalp Grand Hotel and the Matterhorn in summer. Today, guests of upscale hotels are more likely to be corporate barons or stock-option millionaires than baronets, and the typical guest stay is closer to a week (or even a few days) than an entire summer. Formality is also less popular than it once was: Vacationers who enjoy wearing black tie and evening gowns at dinner tend to book suites on cruise ships instead of rooms in mountain hotels. One could argue, therefore, that the Riffelalp Grand Hotel's destruction by fire in 1961 was a blessing in disguise: Nearly 40 years later, it has allowed the Seiler family and their partners to build a replacement that is ideally suited to the travel trends and tastes of the early 21st Century. For starters, the Riffelalp Resort is intimate. Unlike the grand hotels of yesteryear, it accommodates just 128 guests and their dogs or cats in 64 rooms: 46 "Chalet" doubles in the new building and 18 "Nostalgie" rooms in an historic annex of the old Riffelalp Grand Hotel. (Two apartments in the "Alpenresidenz Augstkumme" are also available.) The main restaurant seats 120, while the informal Walliser Keller serves up fondue and raclette to a mere 40 guests. This is not the kind of five-star hotel that books large-scale conventions to fill up its bedrooms and ballroom. The setting is equally delightful: 602 meters or nearly 2,000 feet above the high-season tourist and ski crowds in Zermatt, with access only via hiking paths, ski trails, or the nearby Gornergrat cogwheel railroad. Most rooms have views of the mountains (including Zermatt's trademark, the Matterhorn), and summer or winter outdoor recreation is literally right outside the hotel's front door. Photos: Riffelalp Resort. Used by permission.